Drinking water fountains in Gyms are a vital characteristic when it comes to customers satisfaction. Not only do the drinking fountains and bottle filling stations promote healthier living by allowing for active water intake on a regular basis, but they also secure a gym’s image as a top quality establishment. DrinkingWaterFountains.co.uk has been working over many years to establish a range of drinking fountains, bottle filling stations and coolers that are ideally suited to the demanding needs of the gym establishments in the country. Our solutions range from water bottle filling stations suitable as a source from which gym members can fill their water bottles between workouts to floor standing fountains that offer a quick sip of fresh, chilled water when a water bottle has been left at home. We have the drinking fountain solutions that can provide gyms with a simple & cost effective way to provide their members with safe, clean drinking water throughout the day. The installation of drinking fountains is the first stage to enhancing the fitness service offered by gyms, while encouraging gym members to drink water throughout their workouts and reap the rewards and health benefits that go with an increased intake of water. 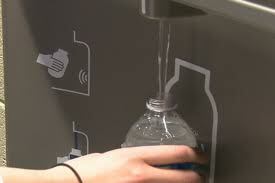 Drinking Water Fountains has installed drinking fountains and bottleless water coolers in gyms across the UK. For more details on our range of gym specific fountains please look at our newly revamped indoor and outdoor drinking fountain product sections. Each drinking water fountain has an image, brief description and a detailed PDF file with technical information to help you make a decision on the product that is right for you. We are always available to answer your call on 0845 500 4455 and a specialist can also be contacted by email contact@drinkingwaterfountains.co.uk .